"The next generation of Alarm Management"
The ProcessVue Alarm Management Suite of software has been developed with the benefit of over 30 years experience of Alarm Management systems. The architecture has been designed to allow communications with virtually any control system, DCS, BMS, ESD, FGS or SCADA bringing data into a standard, configurable format for simple Sequence of Event (SOE) storage and display, to high level EEMUA 191 KPI reporting. ProcessVue combines the latest communication, data logging and reporting technologies, providing clear, relevant and prioritized information to Operators, Supervisors and Managers for critical decision making whether in the control room or the board room. Benchmark your Alarm system performance, understand your Operators workload, identify bad actors & nuisance alarms. Improve Operator response times in critical situation. Sequence of Events and Real Time Display in Internet Browser. Open MS SQL Server Database. SQL Reporting Service for User Defined Reports. Fully compatible with Honeywell TDC/TPS/PKS, Foxboro IA, Yokogawa Centum CS, Fisher Provox, Emerson Delta V, Siemens Telepherm, Siemens S7, Triconex TMR PLC, GE Mark VI and many other systems. ProcessVue is scalable and can be used as a simple standalone alarm logging / printer replacement package to a company wide fully distributed system. Using the latest .NET technology from Microsoft, compatibility with both today's and future operating systems is ensured. An industry standard SQL Database ensures reliable, secure, expandable and portable data storage. A 64 or 32 bit Service oriented architecture means super fast performance on even the largest datasets. Services use store and forward technology over TCP/IP ensuring data integrity is maintained even when a LAN or WAN connection is unavailable. The latest Ajax Zero footprint web client technology means great performance while maintaining simple secure roll out over almost any IT infrastructure. All the latest web browsers are supported from IE6 to IE10, Chrome, Firefox and even Safari. Connectivity to 3rd party applications and systems can be made simple using the very flexible reconstructor module to send data via TCP/IP port or ODBC. ProcessVue is VMware friendly. Together ProcessVue and VMware offer simplified deployment and low operational costs, allowing customers to implement a flexible and scalable platform. The ProcessVue Alarm Management system will collect and store Alarms and Events from many different systems including DCS, BMS & SCADA. Using a web based client, ProcessVue empowers the user with advanced search and filtering tools making it quick and easy to find the data you need. Upgrade to ProcessVue Analyser to get full EEMUA 191 based KPI reporting. Alarm and Event recording and storage (SOE). Collect data from multiple assets and group them together. Per-User configurable interface. Only show assets they are responsible for. EEMUA 191 based KPI reporting. Designed from the ground up, the ProcessVue system provides a consistent and intuitive user interface across all modules, resulting in shallow learning curves and reduced training costs. RS232 with specific drivers developed for Honeywell, Foxboro IA systems and the ability to create intelligent responses for time critical data handshaking. TCP/IP - ProcessVue acts as a Generic/Text Only printer on your network capturing messages as they are printed. File Monitor - Text and CSV. OPC A&E which is widely used by SCADA and DCS vendors worldwide. ProcessVue can connect to IMAC and capture the Data it has stored over the years. Powerful and flexible parsing engine. Create rules for Alarm pattern recognition (IEC 61850). Look-up Table function to add additional information to messages from the Excel files. Full and advanced error log. 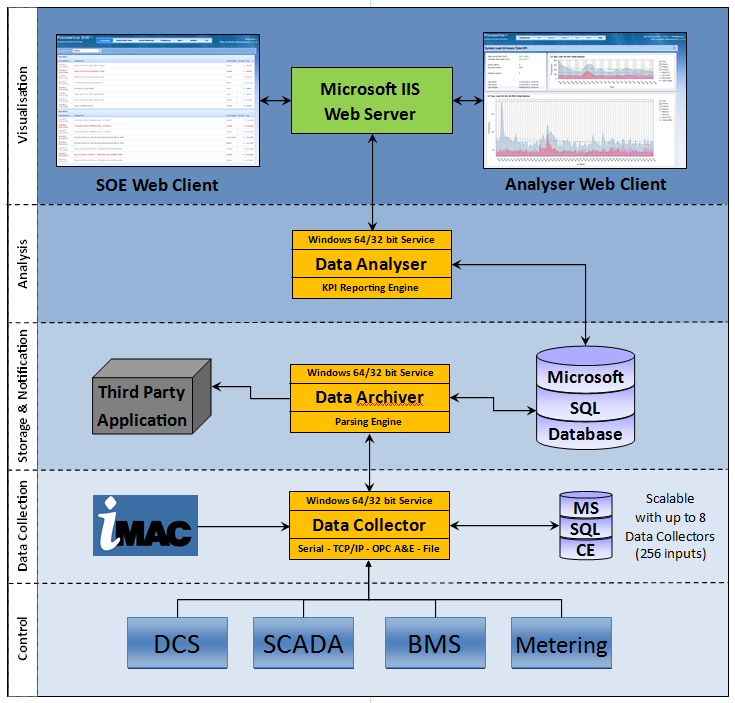 Coupled with a Data Collector and an Archiver, the SOE (SEquence of Events) Web Client provides the user access to the data being collected and tools to search filter and export that data. The SOE Web client also includes an advanced Frequency Analysis tool which quickly highlights bad actors. This client is designed for those customers who just need to collect, store and search alarm data or just need a printer replacement system. EEMUA 191 based KPI reports. Soon to be released, the ProcessVue MOC (Management of Change) module will add a Master Alarm Database to the software suite ensuring changes to set points, alarm priorities and other alarm parameters are managed. Build an Operator response manual. Manage, audit and document changes to Alarm parameters. Work Flows and Collaborative approach means everyone in the review team is aware of proposed changes. ProcessVue has Data Collection points for alarm and event data coming from different systems used onsite, accepting up to 32 data inputs per Data Collector and displaying them in separate SOE windows in the ProcessVue Web Server enabling clear identification of the original data source. The Archiver-Parser formats and parses the alarm string into separate fields in the MSQL Database. The Analytics provides detailed analysis tools and KPI reporting required to identify nuisance alarms and operator workload during steady state and plant upset conditions and to create a company-wide alarm philosophy, improving safety, reducing operator work load, improving performance and reducing operational costs benchmarking to EEMUA guidelines. Our on site alarm rationalization service will be of particular interest to companies wishing to analyze and reduce their number of alarms but who have neither the time nor the manpower to do it themselves. Working closely with customers in a service provider or mentoring role, we can assist with: reduction of standing alarms; definition of rules for alarm prioritization; provision of onsite training for operators for alarm management; and development of a more efficient alarm management procedure. Combining ProcessVue's products and services mean that effective alarm management can now be achieved with minimal effort for maximum effect. Contact us today for more information on how our alarm rationalization services can work for you.